APPLICATIONS: For insulation attachment to STRUCTURAL CONCRETE, wood and steel roof decks. through 18 ga (.045 in. 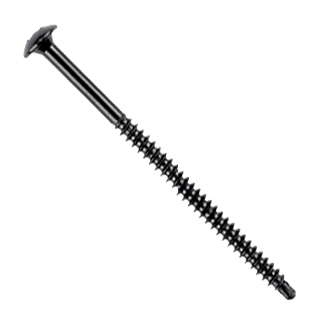 ): Min penetration: 3/4"
Wood 2x (1-1/2" thick): Min penetration: 1"
FR treated; min through penetration: 1/4"
SPECIFICATIONS: Coated Steel Roofing Screws, No. 12 with a self-drilling point. The screws have a 0.2-mil (0.005 mm) galvanized plating and a 1-mil (0.025 mm) fluorocarbon coating. Drill point design prevents fastener walking. Drill point cuts through gravel and BUR. 13 threads per inch for ease of installation in concrete decks. APPROVALS: Dekfast fasteners and plates are Metro Dade and Factory Mutual approved for attachment of insulation board to roof deck. Refer to FM Approval Guide and Supplements for current FM approved insulation fastening patterns. #12 fasteners exceed Factory Mutual corrosion-resistance Standard 4470. INSTALLATION TOOLS: 2000 – 2500 rpm screw guns with hardened #3 Phillips. #12 Dekfast fasteners are available pre-assembled with metal or plastic insulation plates. #12 from 1-5/8 to 8". #14 from 1-1/4 to 12"
#15 from 1-1/4 to 26"
#12 hex head from 1-5/8 to 8"
#12 assembled to 3" round plates. 2-3/8 in. ROUND 20 GAUGE GALVALUME-STEEL BARBED STRESS PLATE, FOR MEMBRANE ATTACHMENT. 1000/BOX. PRICE/BOX. 2 INCH DIAMETER 22 GAUGE GALVALUME PLATED STEEL STRESS PLATE / SEAM PLATE. FOR MEMBRANE ATTACHMENT. SFS DEKFAST # M7540. 1000/BOX. PRICE/BOX.